Whizz all the ingredients for the batter in a food processor or whisk well together. Heat a small pan and when hot grease lightly with butter. Pour in a little batter swirling it round and tipping out any excess. You will want lace thin crepes. Cook over a high heat until the top side is dry, then and briefly cook the underside. Stack up interleaved with greaseproof paper. You will need 8 crepes for this recipe. Crepes freeze well. Peel core and roughly chop the Bramley apple. Place in a heavy pan with 1 tablespoon of water and cover. Cook over a low heat until you have a thick puree. Stir in the sugar and ground almonds. Meanwhile core and dice the Spartan apple. Heat the butter in a frying pan and when melted briskly fry the apple dice until lightly coloured. Add the silvered almonds and cook until they too toast lightly. Mix the contents of the frying pan into the apple puree. Taking one crepe at a time place a spoonful of filling to one side then fold to give an open triangle. Lay the filled crepes in a well buttered dish. Dotting the top with a few small pieces of butter. This can be done ahead. Make the sauce. Melt the butter, sugar and orange juice together add the zest and simmer for 2 minutes. Add the brandy. Meanwhile re-heat the crepes under a hot grill until the filling bubbles and the top crisps slightly. Spoon over the sauce and serve at once. 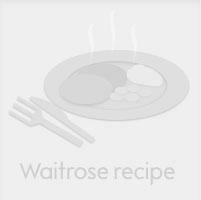 This recipe was first published in Wed Dec 01 00:00:00 GMT 1999.